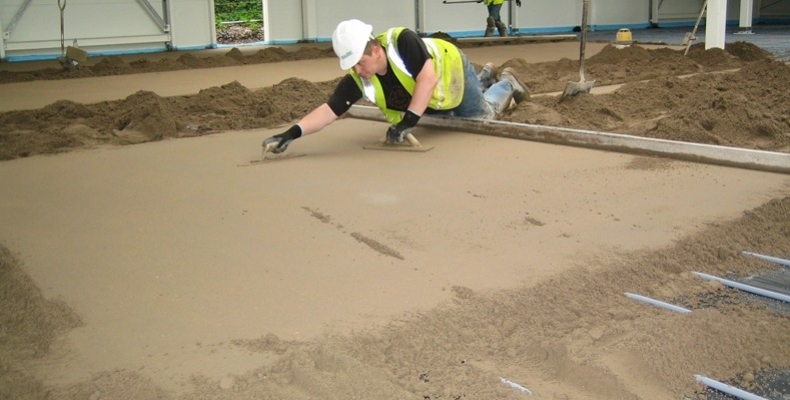 Polypropylene fibres are added and evenly dispersed in a screed mix. This helps to minimise shrinkage and cracking. These screeds contain additives which enable the screed to dry more quickly so that floor coverings can be laid sooner. Send us, by email or post, the architect’s drawings. Prepare a detailed cost quotation within 48 hours and email or post this to you for consideration and approval. Follow up this quotation and make contact with you to discuss your response and answer any queries you may have. Screeding a floor is the process of applying to a floor base a well blended mixture of ordinary Portland Cement with graded sand and a minimal amount of water in order to form a solid, level sub-floor that is capable of recieving the final floor finish. 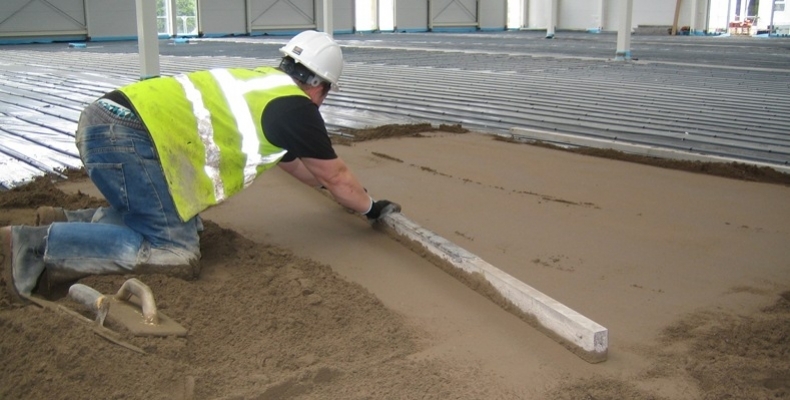 Our experienced floor screeders are skilled at laying this material on every shape and size of floor, ensuring an even and complete floor surface around fixtures like soil pipes, electrics, ducts, thresholds and underfloor heating pipes. Screeding is the perfect solution to providing a solid, level floor where underfloor heating systems are to be installed. The process involves placing damp proof membrane (DPM) over the prepared concrete floor base, then adding a layer of thermal insulation over the DPM. This insulation is designed to accept the tacker clips used to secure underfloor heating pipework. Screed is then laid over the whole area and worked to a smooth, level surface. The screed fully encases the pipework, both securing it firmly in position and allowing efficient heat transfer upwards into the final floor. 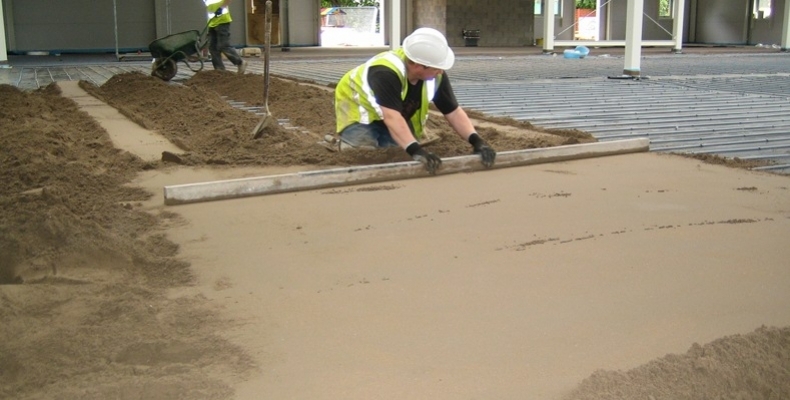 Screeding is therefore a vital step in ensuring the quality, performance and durability of the entire floor system. All works priced by JCW Floor Screeding are competitive due to our supply chain economies of scale produced through bulk buying. We offer a combination of full account, credit or debit card payment options to suit. With twenty years floor screeding experience and 40,000 quotes behind us, we can honestly say we have met every imaginable on site problem, whether it involves access, the special needs of an industry sector like rail stations or screed specification. For the helpful staff here at JCW Floor Screeding there are no problems, only solutions. We will always visit the site before carrying out any works to flag any issues. All our operatives are CSCS card registered, have NVQ2 qualifications and are competent using laser levelling equipment and are issued with all personal protection equipment. JCW Floor Screeding retains the services of Comply at Work, a specialist Health and Safety Consultancy with an in-depth expertise in the Construction and Civil Engineering sectors. We offer full client support in this vital area with risk assessment and materials safety data sheets and comprehensive public liability insurance protection – see our Health & Safety page page for more information. If you need more information or advice about floor screeding for your project or an urgent price, use our quick quote facility now.